I am back in Bristol after a delightful weekend spent in Sussex. 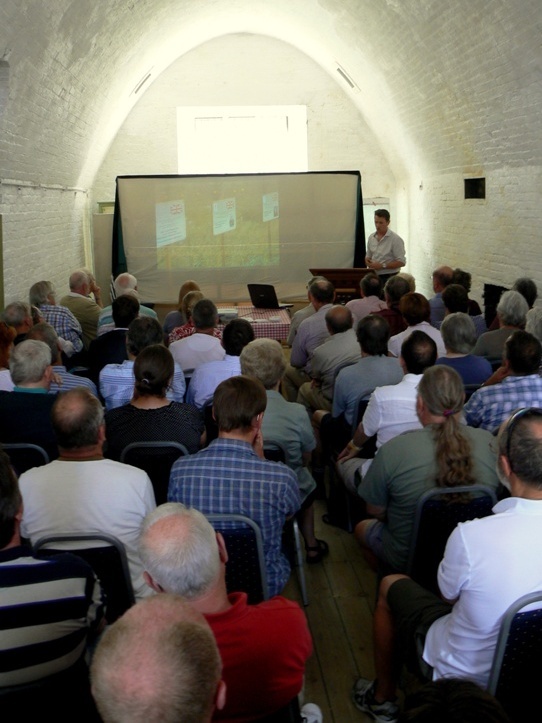 On Saturday I gave a lecture entitled Somme Archaeology: The Glory Hole and the work of the La Boisselle Study Group at Eastbourne Redoubt Fortress & Museum. Despite it being a boiling hot day and the lure of the sea only a few yards away it was standing room only by the time I began speaking in one of the Redoubt’s (thankfully cool) casemates. My talk focussed on the La Boisselle Study Group’s work since June 2011, showing images from the British tunnel system as well as images of surface archaeology and artifacts. I spoke about the actions of the French in autumn 1914 with focus on the capture of the Granathof by the 118th Infantry Regiment on Christmas Eve 1914. British occupation of the ‘Glory Hole’ was also covered with especial mention of underground action by 179 and 185 Tunnelling Companies, RE. I was able to show the current state of excavation and explain the plans for the next tranche of work in September/October. This includes potential exploration of the British tunnel system at the 80ft level. After an hour’s lecture there was a tea break which was followed by a further 25 minute Q&A session. It was good to see friends there, especially Richard Dunning, owner of the Lochnagar Crater. My grateful thanks to Ryan Gearing for organising the series of lectures, Keith Ross (ex-Royal Sussex Regiment) for his kind introduction and the Eastbourne Redoubt Fortress & Museum for providing such an inspiring venue. This entry was posted on Monday, August 20th, 2012 at 5:06 pm	and is filed under Miscellany. You can follow any responses to this entry through the RSS 2.0 feed. You can leave a response, or trackback from your own site.